The Western Pacific Geophysics Meeting will be held in Beijing, China, July 24-27, 2006. It is sponsored by AGU and several other societies in the western Pacific region. This is an excellent opportunity for members interested in the research of the western Pacific region and all related aspects of geophysics. There will be eight geodesy sessions at the meeting. UNAVCO's Will Prescott will be co-convening one of those sessions: Future of Geodetic Networks G08. The abstract submission deadline is March 16, 2006. Don't miss out! 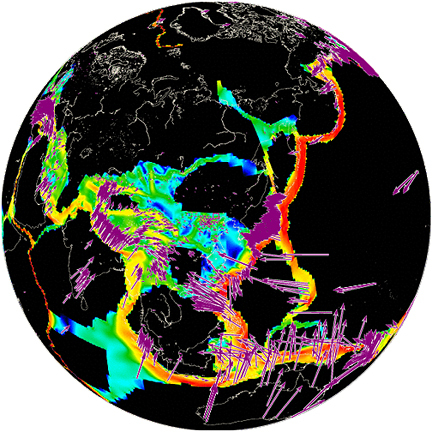 * A plate boundary strain rate and plate motion map derived from shared global and regional GPS solutions lends new insights into continental dynamics. Courtesy of the Global Strain Rate Map project based on the research of Kreemer, Holt, and Haines.